Retailers have to operate in highly competitive environments, where innovation may become a source of sustainable competitive advantage. 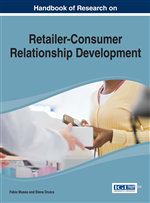 This chapter aims at exploring the relationship between retail innovativeness and the level of technological advancement as well as the ICT solutions implemented by store chains of four retail activities (e.g. grocery, textile, electronics, and furniture and decoration). In addition to this, the authors test the existence of significant differences in consumer perceptions and behavioral intentions between retailers perceived as high innovators and those considered low innovators. As a result, differences in consumer behaviour are found between high and low innovators that may be explained by the strong relationship between retail innovativeness and the technology implemented by the store. Notwithstanding, these findings are sensitive to the type of product sold by the store. In recent decades, the innovation processes in marketing channels have occurred with high intensity and speed, particularly explained by advances in technology that allowed the adoption of more efficient organizational solutions (Musso, 2010). Referring to marketing channels, the concept of innovation must be seen as a strategic activity for both industrial and distribution firms to acquire a competitive advantage along the distribution channel, and as a changing process of the economic function of the distribution systems. As a result of these processes, an increased competitiveness for all firms in the channel has emerged. Technology – in particular, ICT -, social changes and new behavioral patterns of the final demand, have stimulated innovations in retailing. Awareness: In the context of retailing, retailer brand awareness is the extent to which a retailer’s name is familiar to consumers. Behavioral Intentions: In the context of retailing, this concept can be defined as the consumer willingness to develop some categories of behaviors such as referrals, price sensitivity, repurchase, complaining behavior, loyalty and word of mouth (Zeithaml et al., 1996). Retail Innovativeness: According to the definition of Homburg et al., (2002) , it is the degree to which retailers in the local market adopt new merchandising or service ideas. Perceived Value: “Consumers’ overall assessment of the utility of a product based on perceptions of what is received and what is given” (Zeithaml, 1988, p. 14). Information and Communication Technologies: Solutions used to create, record, manipulate, communicate, exchange, present, and use information – e.g. data, conversations, images, videos, etc. Retailer Product and Service Quality: Retailer perceived quality is defined as consumer’s judgment about a retailer’s overall excellence or superiority on the perception of goods and services (Pappu & Quester, 2006a; b). Retailer Brand Equity: Hartman and Spiro (2005 , p. 1114) define store equity as “the differential effect of store knowledge on customer response to the marketing of the store.” Furthermore, Jinfeng and Zhilong (2009 , p. 487) refer to retailer equity as “the incremental utility or value added to a retailer by its brand name,” stressing an essential task of establishing the brand being identified and generating a differential response.